without cutting or splicing any factory wires! 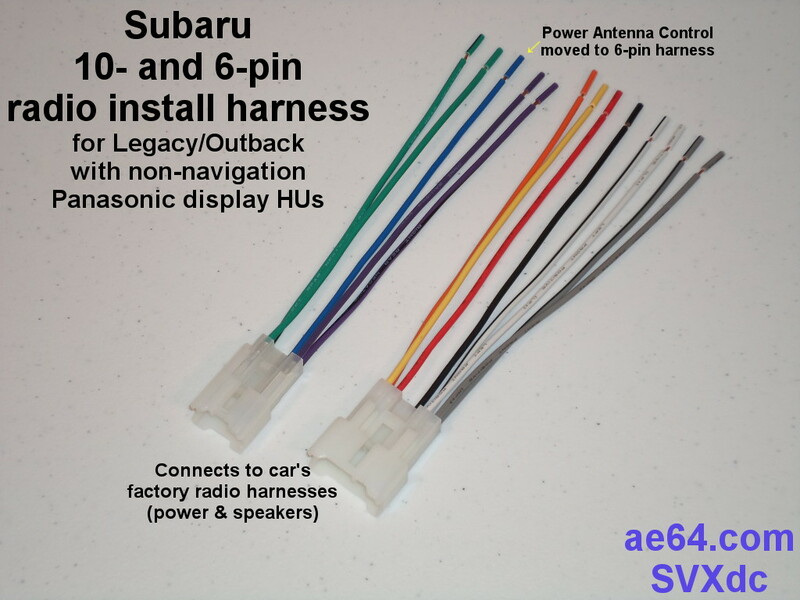 Install an after-market head unit (HU) in recent Subaru, Toyota, and Scion models (any car where these harnesses fit: Metra 70-1761, Scosche TA02B, American International TWH-950, Aerpro AP1761, etc.). 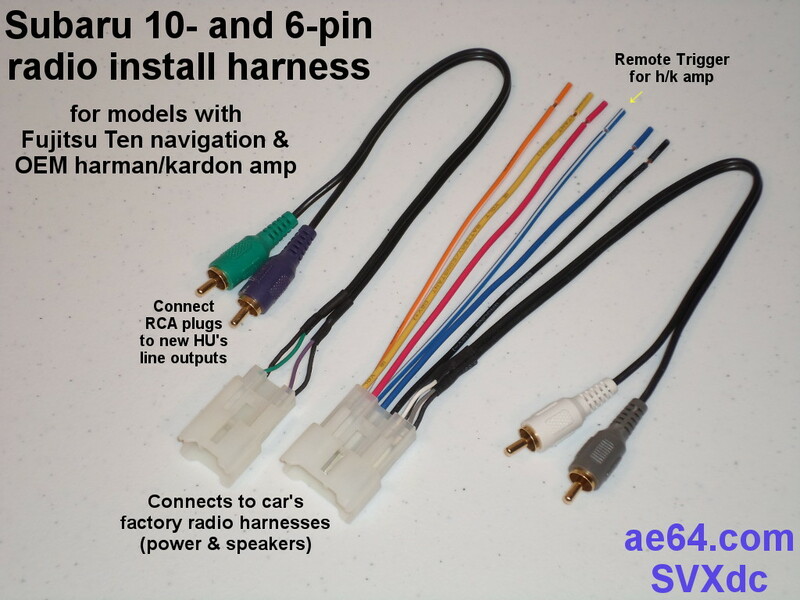 Note: If you want to keep your factory head unit and add a subwoofer, speaker amplifier, Line Output Converter (LOC), audio processor, gauges, phone car kit — any application where you need to tap off or connect between wires on the power/speaker harness — see this combined 10- & 6-pin forward/reverse harness. 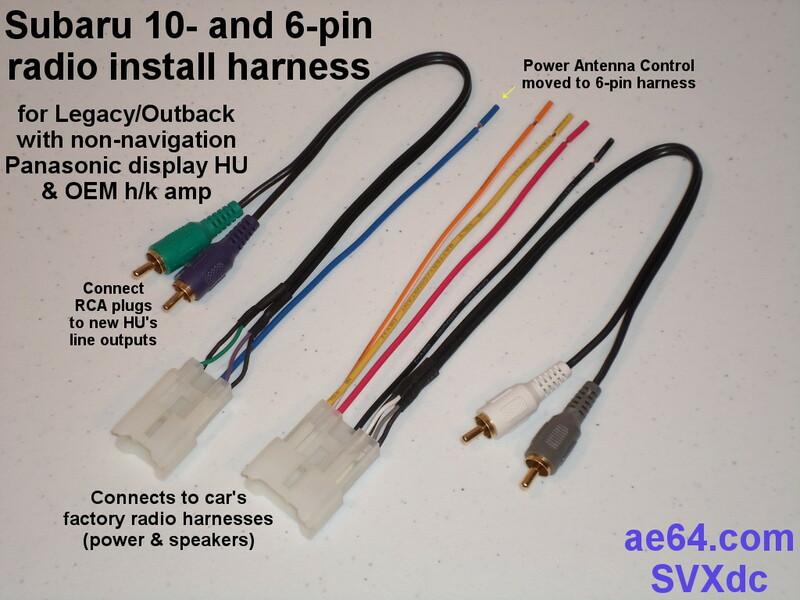 You do not need the combined harness when switching to an aftermarket HU. What other harnesses and adapters do you need? Want to retain your factory Steering Wheel Controls (SWCs) and aux and USB sockets? Need harnesses for different models or non-navigation? All Subaru models which use this harness include a lead to supply +12V power to the car's AM/FM antenna booster amplifier. 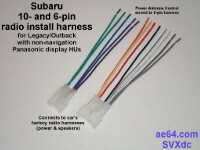 The standard version of this harness has the power antenna lead at pin #8 on the 10-pin harness, where it is needed for all Subaru models with Fujitsu Ten navigation. HU models include PE669U1, PE658U1, PE627U1, PE438L1, and PE427L1. If you have one of these (or similar with 4.3" screen), be sure to tell me your factory HU model number when you order. 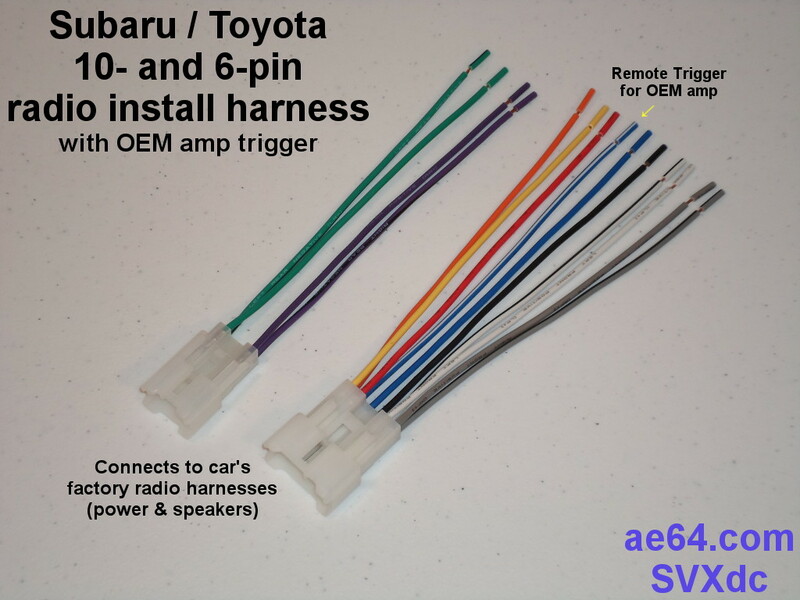 Most recent Toyota and Scion models do not have the power antenna lead on this harness. 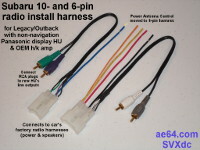 Instead, it is a separate lead on the AM/FM antenna harness. 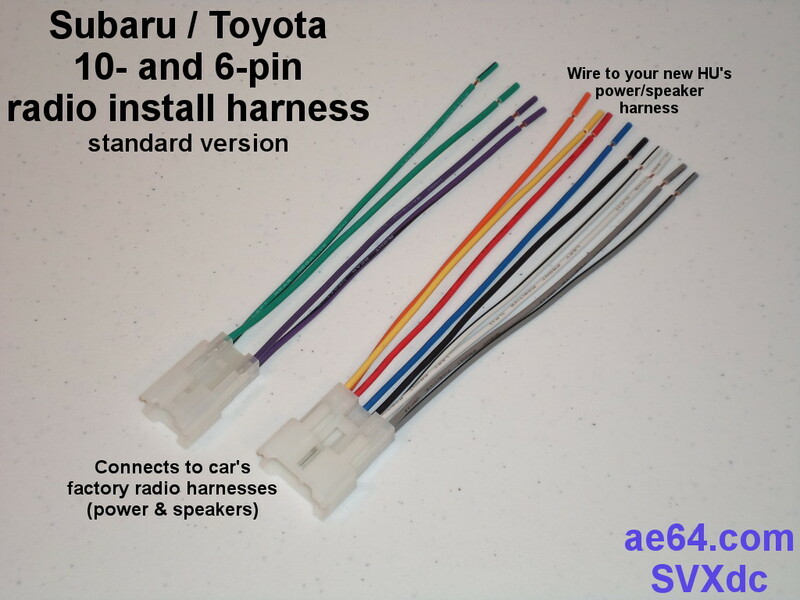 For those cars, you can extract the wire from the 10-pin harness to reduce the number of extra wires behind the HU. You will need an antenna adapter that includes the power antenna lead. If your car has the OEM harman/kardon amplifier and speaker system, see this post. I'm now recommending that people with the h/k amp use their aftermarket HU's line-level outputs. 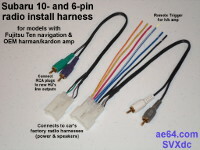 You'll want the version of this harness with male RCA plugs instead of plain wires for the 4 speaker signals. 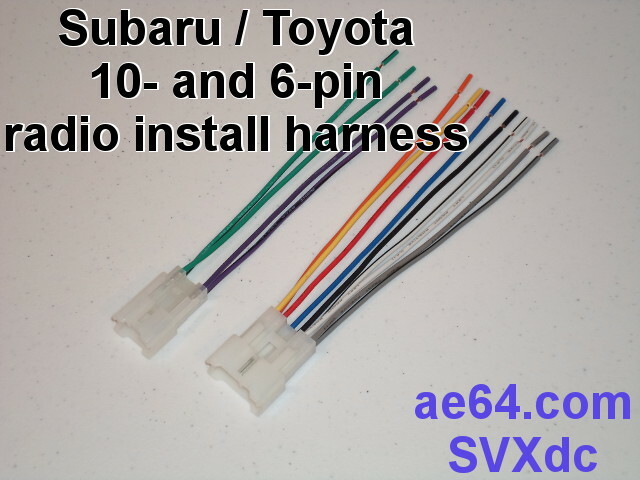 See my Subaru/Toyota 10- & 6-pin pin-out table for more information about the factory wires. Add this lead (BLUE/WHITE) to the harness for an additional $2. For custom lighting projects (e.g., footwell lights, customized gauge illumination, etc. ), ask me about adding the Illumination(–) lead for an additional $1. Note: aftermarket HUs do NOT need (and cannot use) this. Connect an aftermarket HU's "dimmer" wire to the "Illumination (+)" wire that I include standard! Some Toyota models do not have this signal. Check your car's harness or wiring diagrams before ordering.